Rafa Benitez confirmed his youngsters and the new signings will play a very important role this season as Real Madrid eased past Levante with many of the regular substitutes in the starting eleven. Casemiro, Mateo Kovacic, Nacho, Danilo, Lucas Vazquez and Jese Rodriguez proved their value and helped their team earn a victory that sees them reach the top of the table. Goals from Marcelo, Cristiano Ronaldo and Jese made the Santiago Bernabeu fans enjoy a win after two consecutive draws in La Liga. 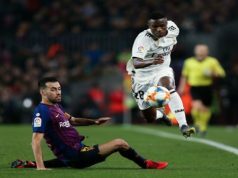 Levante were very intense at the start and they threatened their rival a couple of times, with Deyverson missing a good chance to open the score as he fired a defective shot inside the box. When the Santiago Bernabeu fans were starting to get nervous, two terrible mistakes from the visitors gave Los Blancos a comfortable 2-0 lead. Right before the half-hour mark, Marcelo stole the ball in midfield, played a one-two with Ronaldo and fired into the bottom corner. Three minutes later, Jose Mari lost the ball in front of Kroos, who played in Ronaldo, and the Portuguese slashed a powerful shot from 25 metres to make it 2-0. 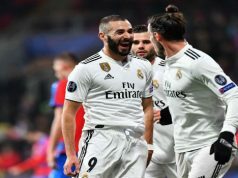 Just before Ronaldo scored his sixth goal in La Liga, Levante could have levelled as Deyverson sent a brilliant header to the bottom corner, but Keylor Navas made a miraculous save proving he is in spectacular form. Real Madrid played more relaxed in the second half, and Benitez even allowed himself to rest Gareth Bale after the break. Levante never gave up, but Keylor Navas put in a superb performance to get another clean sheet this season. The Costa Rica international has only conceded two goals so far. Jese Rodriguez came in with twenty minutes to go and he made a big impact, becoming a nightmare for Levante’s defence and scoring an impressive goal. With eight minutes to go, the Spaniard received the ball inside the box, dribbled past a defender and flicked an effort into the top corner.